Since I settled for the 10 element 435MHz and IO 145MHz loop antenna (IO-10EL) I have been getting into the OSCAR Satellites with ease. 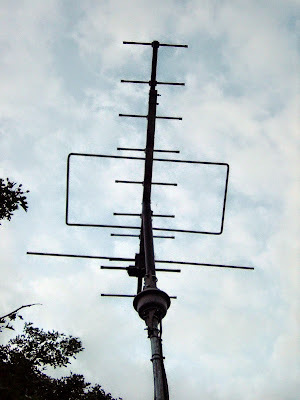 I have been making lots of QSO's with the home built beam fixed at 30º elevation for the past year or so on FM and SSB. Earlier this evening I made QSO's on AO-51, HO-68 and VO-52. On AO-51(FM) I worked ON5NY, on HO-68(SSB) I worked IZ7JXJ, DJ8DT and for the second time this evening ON5NY. On VO-52(SSB) I worked IZ5AVK and DK1IE, all were good signals and all Stations could hear me at 5/9. I was running approximately 35Watts from my Yaesu FT-847 and managed to still get in to HO-68 at a total distance of 2500 miles as the the Satellite headed over North America. I am always amazed how well my homemade antenna performs and I still get the biggest buzz when the "birds" pass over, in fact my hard done by YL - Louise M3TLL thinks I have a problem and calls me a "Satellite Junkie". Unfortunately for Louise, there doesn't seem to be a cure available on prescription yet!